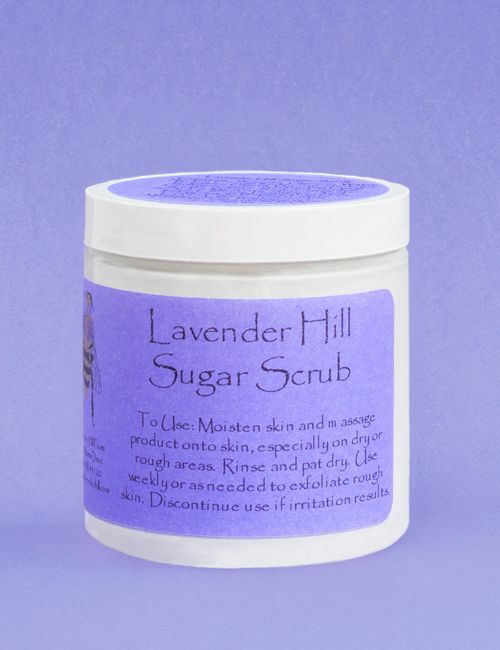 Our lavender sugar scrub is a wonderfully fragrant and gentle way to exfoliate your skin, including your face. Contains humectants said to retain moisture on the skin, and glycerine soap for gentle cleansing, lavender essential oil for soothing scent as well as fine granulated sugar for exfoliation. You'll love the way your skin feels after using this product just once a week or so! Contains: Sucrose, Glycerin, Water, Sodium Cocoyl Isethionate, Sorbitol, Propylene Glycol, Disodium Lauryl Sulfosuccinate, Sorbitol, Sodium Laureth Sulfate, Sodium Stearate, Sodium Myristate, Stearic Acid, Sodium Chloride, Diazolidinyl Urea, Iodopropynyl Butylcarbamate, Triethanolamine, Tetrasodium EDTA, Benzophenone-4, Methylparaben, Propylparaben, Lavandula angustifolia EO.